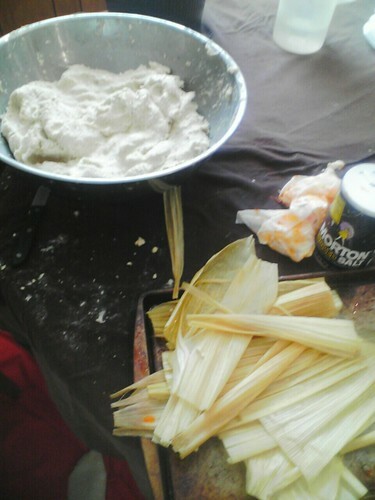 In Mexican Culture it’s tradition to make Tamales around this time of year. It usually means you have to make over a hundred of them because you can almost have guaranteed, everyone and their momma’s will be over your house eating tamales. This is the first year I made some. Ok, wait. I’m not going to take all the credit. I mean, buying the maza (corn dough), meat and spreading them on the corn husks count, right? haha. But honestly, my Grandma cooked the meat and we bought premade Maza a few days before we actually made them. However, it was a lot of work! It paid off though. They came out delicious and I’ve had them twice today. Reheated tamales are the best! Is there a certain food you make around this time of year or for any certain holiday? BTW everyone, we made 20 lbs worth. That’s A-LOTTA tamales! It’s Ana’s first post on the site! I don’t think I’ve ever made 20 pounds of food at once. I concede defeat. It IS my first time, huh! ?